From Friday 17 May until Sunday 19 May 2019, the EBOT Spring Meeting will take place in Rotterdam, the Netherlands. All information concerning the meeting can be found on this webpage. Please note that Friday 19th April is the deadline for registration. Via this form you can register for the EBOT Spring Meeting from 17 until 19 May 2019. Registration fee includes: welcome lunch on Friday, coffee and tea breaks, lunch on Saturday, two dinners and a sightseeing tour of Rotterdam. Registration fee for meeting participants is €600,-. Hotel Rooms are available at the meeting venue NHOW Rotterdam. Hotel prices are including breakfast, but excluding city tax. Hotel prices are including breakfast for one person, but excluding city tax. Please provide us with your flight details in case you have booked your flight to the Netherlands already. At which airport do you arrive? Please provide us with the flight number of your arrival flight. At what date do you arrive? At what time do you arrive? From which airport do you depart? Please provide us with the flight number of your departure flight. At what date do you depart? Should you have any remarks or other requests, please let us know. The EBOT Spring Meeting 2019 will take place in Rotterdam, the Netherlands. 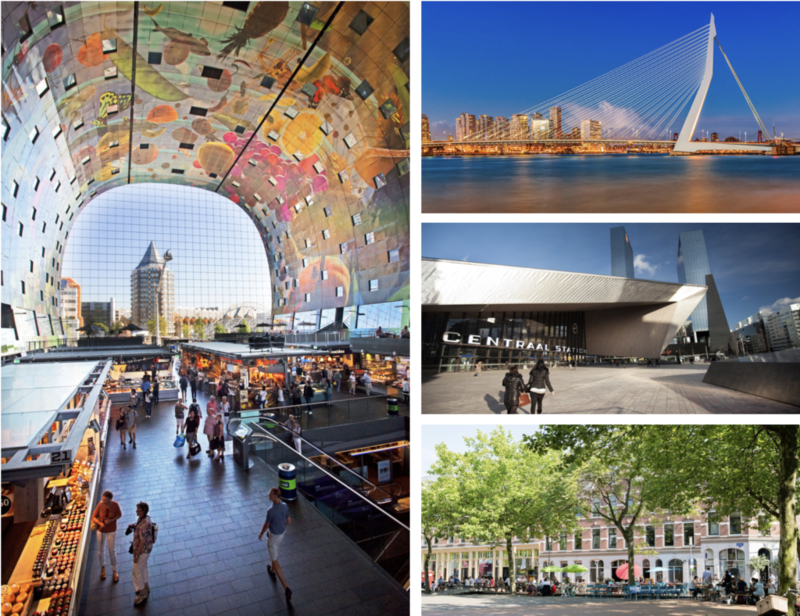 Rotterdam is a dynamic metropolis, the ‘Gateway to Europe’. A city that is constantly reinventing itself. But above all, Rotterdam is a city you have to experience for yourself. The story of the city, the bombardment and reconstruction, and the drive to innovate that locals still use today to shape their city all make Rotterdam a fascinating place to visit. Everything seems possible here, and there’s so much left to explore. Is Rotterdam a must-see city? Absolutely! More information about the city. The EBOT Spring Meeting 2019 will be in the NHOW Rotterdam hotel. 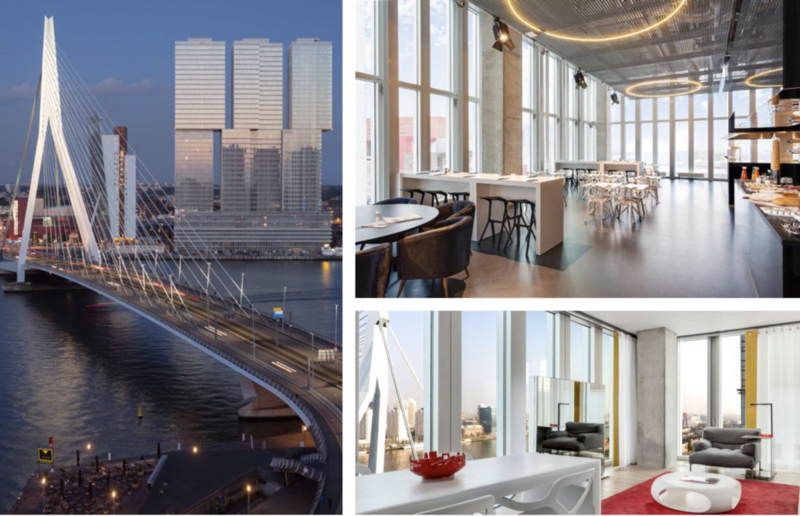 Surround yourself with the latest design, art & architecture from Rotterdam, in a hotel designed by renowned architect Rem Koolhaas (OMA). Get your mind re-set by the in-house art exhibitions, inspirational speakers, product launches and conferences, and become part of the best urban culture has to offer. And don’t worry if all these creative sparks get you a bit tired; we’ve got very comfy beds too! A professional guide explains all about the historic location of Markthal, the building & design, the concept and the construction of the huge glass facades. Let us amaze you with fun facts that you did not hear before! You will get a special look behind the scenes, for example in the underground logistic (cool) center. The tour travels along the Tijdtrap (Time Stairs) showcasing historic artefacts found during the excavations of the parking garage underneath Markthal. The guide will take you up to the walk-way on level +1, to experience the beautiful ceiling artwork to the fullest. The tour includes a ‘Meet&Taste’ with one or two entrepreneurs who love to tell about their work in Markthal. Visitors to the museum are often astonished by the wealth and variety of the collection. The scope and diversity are thanks to 1700 private collectors who have gifted no fewer than 50,000 objects in almost 170 years. The museum contains old master paintings and sculpture, modern and contemporary art, decorative arts, pre-industrial household objects and industrial design. The collections of prints and drawings, early Netherlandish painting, Impressionism and Surrealism are among the best in the world. A selection of highlights from the collection will be on display in the galleries surrounding the Bauhaus Exhibition. 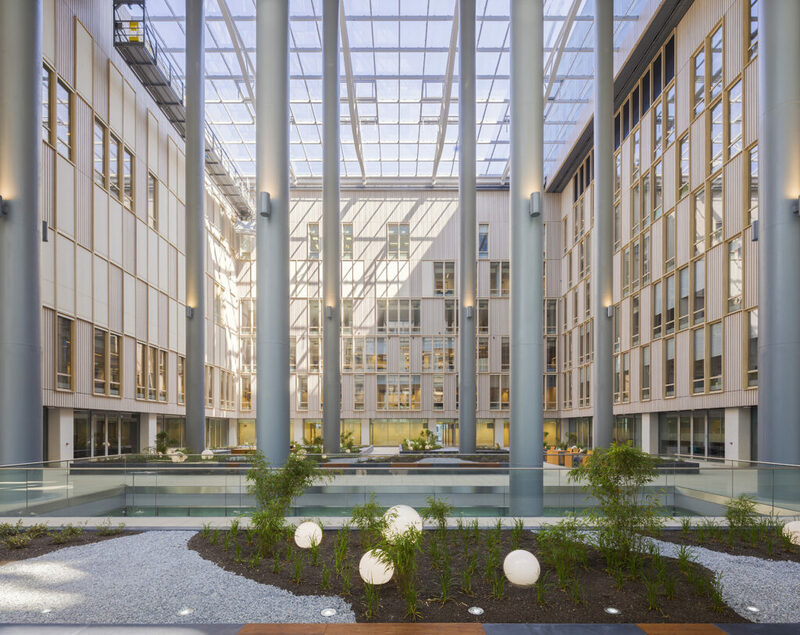 Erasmus MC is the most innovative university medical center in the Netherlands and one of the world’s leading centers of scientific research. Moreover, their building recently got nominated as Best Building of the Year which is very extraordinary for a hospital. On Friday 17th of May we will visit the Erasmus MC to see all new architecture, innovation and techniques. Saturday 18th of May we will visit Schiedam. A historic municipality, part of the Rotterdam metropolitan area. It has some very nice canals to walk or cruis around and is well known for having the tallest historical windmills in the world. In addition, it is renowned for its production of Jenever. This production was the source of much of the wealth that built the city into what it is today. We will visit the Jenever Museum to explore the Roots of Schiedam. In addition, we will visit the municipal museum of Schiedam where we will see the ‘Manzoni in Holland’ exposition. Manzoni is a famous artist. In the sixties he made art with his breath, canned his own crap, autographed bodies and invited people to stand on a pedestal. On that magic plinth everyone became a work of art, a living sculpture. His revolutionary approach made him one of the great innovators of the 20th century and his can of crap became an icon of avant-garde art. 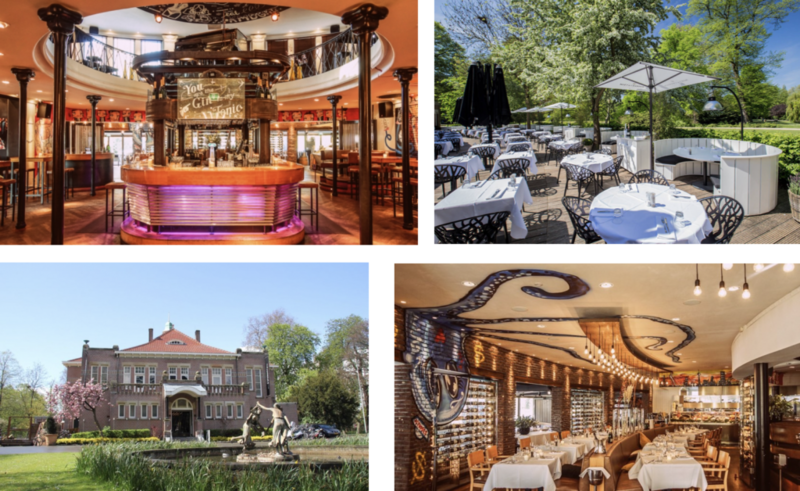 A dinner in The Harbour Club: an almost hundred-year-old villa in one of the city parks of Rotterdam. An extraordinary location for an extraordinary restaurant! The ambiance is a lot like that of ‘The Boathouse Café’ in New York’s Central Park. Inside, the restaurant is styled as a rugged-looking modern day restaurant. A visit to The Harbour Club is pure and intense enjoyment, guaranteed. High-quality cooking with a dash of playfulness, but always with an eye for detail. On sunny days, guests can lounge on the renovated luxurious patio. Welcome on board of the SS Rotterdam! As the former flagship of the Holland-America Line, SS Rotterdam has sailed the seven seas. Today the ship is permanently moored in Rotterdam.